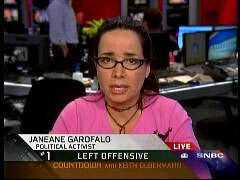 If Janeane Garofalo says something bad about the Obama administration, does that mean she's a racist redneck? After all, she's been telling people almost since Inauguration Day that anyone that disagrees with this president does so because of the color of his skin. So when she told the A.V. Club Friday, "There are so many things in the Obama administration to be sick over that certainly didn't change" and "I was surprised how disappointing the Obama administration has turned out to be," there has to be a racist element in play, right? AVC: You gave an interview several years back, deep in the heart of the Bush administration, where you said that the reason that you didn't do stand-up as much then was that you didn't find anything funny anymore. So can we assume that you're ready to laugh again? JG: Yeah, there was so much stuff that broke my heart during the Bush years that I honestly could not do stand-up without going down one of those tangents and getting very strident. But also I was working at Air America five nights a week, so it was very difficult to do stand-up, because I wasn't leaving Air America until 11 p.m. So there was that. Now, granted, there are still as many heartbreaking things going on. There are so many things in the Obama administration to be sick over that certainly didn't change. And also our media, if it's possible, seems to be getting even worse. The alleged news media. And then there are the teabag racists adding insult to injury. But I don't have that same heartbreak anymore, because it's not fresh heartbreak anymore. It's like I'm used to it. I'm sure we all are just used to it. I have to say I was surprised how disappointing the Obama administration has turned out to be. That did take me by surprise. Which, let's be very honest about what this is about. It's not about bashing Democrats, it's not about taxes, they have no idea what the Boston tea party was about, they don't know their history at all. This is about hating a black man in the White House. This is racism straight up. So, when white conservatives express their displeasure with the Obama administration, it's "racism straight up." But when she does it, not so much. AVC: You did spend last year as a very visible target of right-wing hate because of that comment you made about teabaggers. JG: But I don't know if it's on anybody's mind. It's on the teabagger-type mind, but I don't know if it's on normal people's minds. Does that make sense? The teabagger thing and the right-wing thing-they pick easy targets, and a female in the entertainment industry is low-hanging fruit. It's very easy to mock and marginalize people in general who are in the entertainment industry, for some reason. But then definitely there's the double standard and the misogyny that goes through it as well. They've got no problem with Will Ferrell or Alec Baldwin or Viggo Mortensen, but they tend to take issue when a female says something. It's just an easier person to bully. And they just love making mountains out of molehills. It's just a fact. If you don't recognize the racist element in the teabag movement, you're either dishonest, or you've never seen the teabag movement, or heard of it, or been acquainted with it in any way. Ah, so the reason folks on the right go after her is because they're misogynists. Let's add up the paranoia at play: when conservatives attack Obama, they're racists; when they attack her, they're sexists. Honestly, this is a woman in SERIOUS need of psycho-therapy. Regardless, let's address her misogyny theory, shall we? Garofalo claimed the right-wing has no problem with Alec Baldwin. Maybe she ought to check our Alec Baldwin page to get a clue, as he's been the subject of almost twenty reports since NewsBusters' inception. We've also done pieces about Will Ferrell's stupidity. As for Viggo Mortensen, if he's said anything you feel we need to address, Janeane, please feel free to send it to our tips line. AVC: You've also been called out by name and invited to tea parties by people like Deroy Murdock and other African-Americans within the Tea Party-people who probably don't know you from anything else-ostensibly just so they can prove to you that there are minorities involved, so therefore they aren't racists. JG: But not really. They've put that out on their side. They have never really invited me. They claim that they have, but they really haven't. And having said that, I would never go. They will always say, "I invited so and so, and she declined," when they've never gotten in touch with me. [Laughs.] But then also, a lot of the things they say I say, I've never said. They just make things up whole cloth. Really? You were never invited? Did they make this up? Certainly not. Garofalo just refused to show up! AVC: Last year, Lou Dobbs accused you of being hypocritical for encouraging people to protest during Bush's administration, but then dismissing the Tea Party protests. How would you say the situations are different? JG: First of all, Lou Dobbs is ridiculous. Secondly, there was plenty to protest for the Bush administration. Protesting the color of a man's skin is not a worthy protest. That's what the teabaggers are about. The first Tea Party protest was scheduled for Inauguration Day. So what were they upset about? Which part of the job he was doing before he even did it were they upset about? Secondly, if they claim to be upset with government corruption, government takeover, crazy spending, where were they from 2000 to 2008? The first Tea Party protest was scheduled for Inauguration Day? Actually, nothing could be further from the truth. In fact, the Tea Party's roots go back to Florida in 1983. According to Wikipedia, there were Tax Day protests associated with the Tea Party throughout the '90s. Furthermore, the modern iteration of this movement is tied to Ron Paul's presidential campaign when a fundraiser in December 2007 was set up to commemorate the 235th anniversary of the Boston Tea Party. As for Garofalo's claim that there was a Tea Party event the day Obama was inaugurated, Wikipedia lists the first such gathering in 2009 happened on February 10 in Fort Myers, Florida. As with just about everything this comedian says, whether intended or not, it's typically a joke not to be taken at all seriously.